The Mission of Frontier Builders, a Division of Leeville Construction, is to perform to the highest level of construction services possible for their customers. 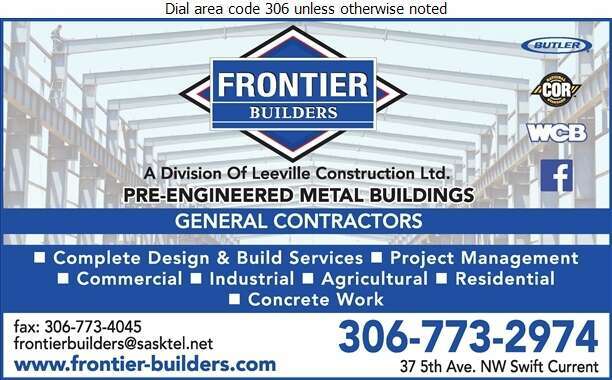 Frontier Builders supplies complete design & build services for commercial, industrial, agricultural and residential customers. Their services are always client-focused with the knowledge and experience to achieve and exceed goals of schedule and costs. The diversity of Frontier Builders work has demanded they become proficient in all types of construction. They have proven their ability in pre-planning, purchasing, scheduling and meeting budgets. They have worked with all types of construction contracts and their pre-engineered Butler Buildings offer design flexibility and faster construction.